The Due Process clause of the US Constitution provides that no person shall be deprived of life, liberty, or property, without due process of law. That principle has historically been interpreted to prohibit extrajudicial killing of suspects without a trial or some other legal proceeding. 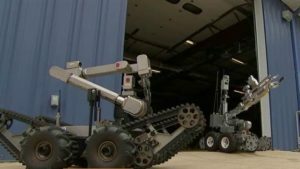 In the case of the Dallas Police robot bomb the police circumvented any judicial process and served as pre-trial executioners when they were unable to apprehend the shooter. I am certainly not defending the actions of the suspect and I understand that efforts were made to apprehend him before he was bombed. I still take issue with the idea that bombing a suspect is an acceptable tactic, even as a last resort. Using bombs on suspects not only violates due process but it also blurs the line between military and police tactics. The recent public concern and push back over the use of the robot bomb is warranted and necessary to preserve our constitutional principles as well as the peace and civility of our streets. While bombs have existed for decades, there are many reasons why police don’t use them on our civilians. Nobody wants weapons of war on the street that will transform our cities into war zones with bomb blasts. We should all be concerned when our already militarized police force takes this major step towards further militarization. Whether or not the Dallas shooting suspect deserved to die, our civility and our constitutional principles do not deserve the same fate. As Americans we claim to hold a moral authority among nations because of our constitutional values like due process, free speech, the right to a fair trial and the presumption of innocence. When we agree to compromise any of those fundamental rights then everyone loses. There are some who believe that a cop-killer does not deserve due process, I disagree. To honor our legal principles we have to insist that they apply in every situation. Compromising our principles even once is a collective compromise of our rights and once we open that door it becomes very difficult to close. Today the exception was made for a cop-killer, tomorrow it may be a gang member, and eventually we may end up with Apache helicopters engaged in urban tactical warfare firing on streets and homes where police feel that their safety is compromised and their justification will be to preserve police and civilian life at the expense of our founding documents and principles. To be clear this was not the first time our due process clause was compromised by the state. Every time a young black man is shot and killed in the streets we violate some of the same constitutional principles, so much so that many Americans have become immune to the state violations. Many insist on ignoring the issue and defending the officers involved by reminding us how difficult and dangerous it is to be a policeman and that we have to protect our cops from dangerous criminals. I agree that it is a dangerous and difficult job but officers willingly embraced that career despite the dangers. They choose to put themselves in harms way to serve and protect the public, civilians don’t make that choice but they still often suffer the same dangerous consequences, especially if they’re black. Fear can not justify extrajudicial murder and lethal force can not be the initial response to a scary situation. I know that not everyone has the restraint and resolve to keep a gun holstered in tense situations. Those who lack the necessary restraint need to find other work and do not belong on the street with a badge and gun patrolling communities that they already fear and distrust. It’s clear to me that the number of guns in America exacerbates the issue of police violence. Police are afraid that they can be shot anytime because guns are everywhere and as we saw in Dallas, isolated police misconduct by a few bad apples can make every cop a target in every city in America. That reality puts police on the defensive and they often decide to shoot first even before they are confronted with a suspected weapon. Following the shooting in Dallas, police scrambled to detain and question many innocent protesters who were armed and were therefore suspects. The Dallas police chief even made statements calling the open carry law into question indicating that it contributed to the confusion and hysteria of the situation. Our gun laws are absurd and archaic, despite what the NRA tells us. Perhaps after losing five sworn peace officers to an angry sniper we will reconsider our gun laws in order to protect our cops and civilians. The Dallas shooting, Alton Sterling, Philando Castile, these are all examples of senseless gun violence and it is within our power to legislate necessary change. The time to address this issue is now while public sentiment and political will are simultaneously focused on the loss of black lives and police lives. The tension between police and minority communities will not disappear anytime soon but we can help deescalate the situation by taking steps to remove the guns. We must strike while the iron is still hot to legislate change or we will watch the fire continue to burn and destroy lives and communities.